Students in the Boston College part-time MBA program at the Carroll School of Management have the option of taking online or hybrid courses. Up to 30 percent of the degree can be earned online. Students who have demonstrated a mastery of a core subject may receive advanced standing credit, which reduces the number of courses you’ll need to complete your degree. Students can “waive” up to 15 of their credits through the advanced standing credit. Most part-time students finish their degree in three years and take two courses each semester. Additional courses can be taken in the Summer. All part-time students must complete their degrees within six years. Evening classes typically meet from 7 to 9:30 p.m. on weekdays with some classes meeting from 4:30-7 p.m. Classes may occasionally meet on Saturdays. Boston College part-time MBA students must complete 20 courses in order to graduate. Additionally, part-time MBA students are eligible for advanced standing if they have completed prior coursework in a core subject or hold a professional certification, such as the CPA or CFA. Applied or experiential learning also plays a large role in the Carroll School MBA experience. Students are afforded myriad opportunities to learn from industry practitioners and gain exposure to real-world business problems. Through the International Consulting Project elective course, for example, students have traveled to China and Peru to complete consulting engagements for real clients. As part of the Warren Buffett and Berkshire Hathaway Field Experience, select students travel to Omaha to meet Buffett and tour Berkshire Hathaway. For students interested in technology, the school hosts weeklong “TechTreks” to New York City, Silicon Valley, and Seattle to participate in master’s classes with some of the industry’s leading executives. 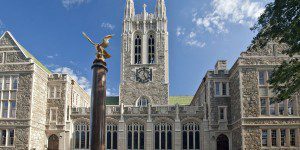 Given Boston College’s Jesuit roots, a final requirement for graduation is the completion of 20 hours of community service. The Carroll School has 107 students into its part-time MBA class. The class average GMAT score was 590. Part-time students averaged four years of full-time work experience prior to matriculation and were on average 28-years old. Women constitute 35 percent of the class, while 14 percent of students are African-American, Hispanic, Asian or Native American. The mean GPA of the incoming class was 3.32, with the most popular undergraduate major being business and commerce at 16 percent. Around 10 percent of students pursued a finance major, 7 percent studied economics and 6 percent graduated with engineering degrees. The cost per credit for the 2018-19 academic year is $1,744. At 57 credits, students will spend approximately $99,408 in total in order to complete the part-time program. Books and fees cost an additional $1,500, and all students who do not receive health insurance from their employer must pay $3,095 for such coverage. In order to apply for admission to the part-time program, first-time domestic candidates must submit a completed online application form, résumé, one personal essay, one recommendation letter, transcripts from all academic institutions attended as part of a degree-granting program, official GMAT or GRE scores and a nonrefundable application fee of $100. Interviews are not available to part-time MBA applicants. International applicants must submit either: TOEFL, IELTS or PTE scores if English is not their native language. Candidates who applied for admission within the past year can re-apply for a place in the program using a streamlined form. In addition to this form, applicants must submit a cover letter, resume, updated test scores and transcripts if applicable and an essay.